Parker 1940s Vacumatic Major fountain pen in laminated grey pearl. It has a black cap jewel and nickel plated trim. The grey pearl is the only vacumatic to have nickel plated trim. Fine nib. Very nice condition. The pen is fully restored and working well. 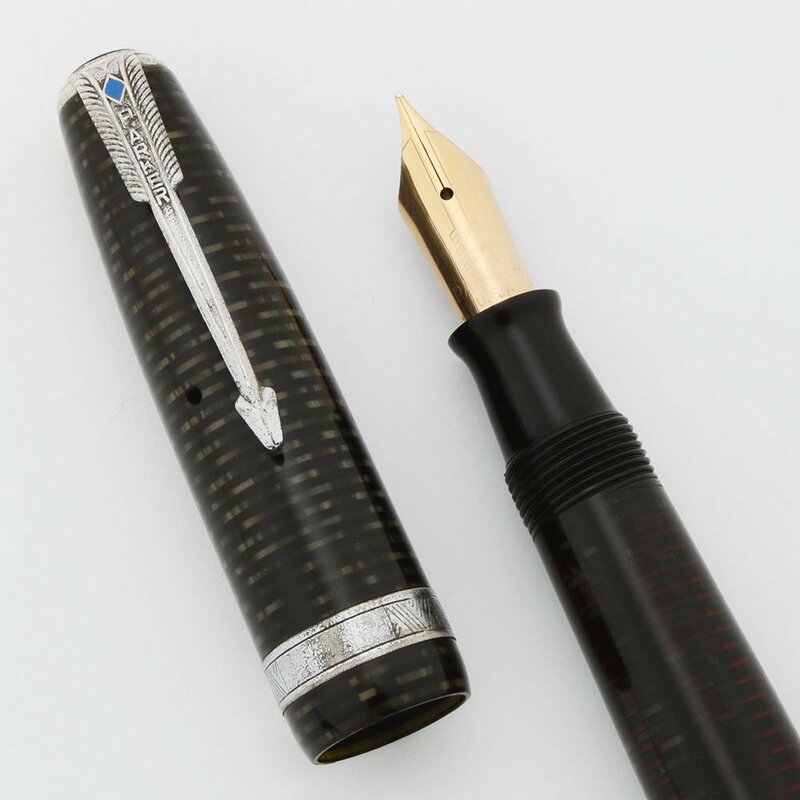 Length 5", this is the "Major" version of the Vacumatic with the single cap band and Blue Diamond clip. Filling System Vacumatic plunger filling system has been restored here at Peyton Street Pens and is in excellent working condition. The bladder has been replaced and the pen has been tested. It has the late-era plastic plunger. Color Laminated Grey Pearl body with alternating bands of amber and a gray gradient. It has a black cap jewel and an approximately 1/8" chevron patterned cap band. The trim is nickel plated to match the Grey Pearl and is the only Vacumatic to have nickel plated trim. Nib FINE 14k nib has a bit of give and is a smooth writer. Lots of tipping. Condition Very nice condition. The coloration is quite dark though the transparency is goodand the pen is nice and shiny in appearance. The cap and barrel have moderate scratching, with some deeper scratches toward the end of the pen and with a few blotches of scratching to the right of the imprint. The cap has bite marks toward the top. The clip and trim ring have plating wear and scratching, very common with the nickel plated trim. The blue diamond and the black jewel at the top of the cap are fully intact and look really great.